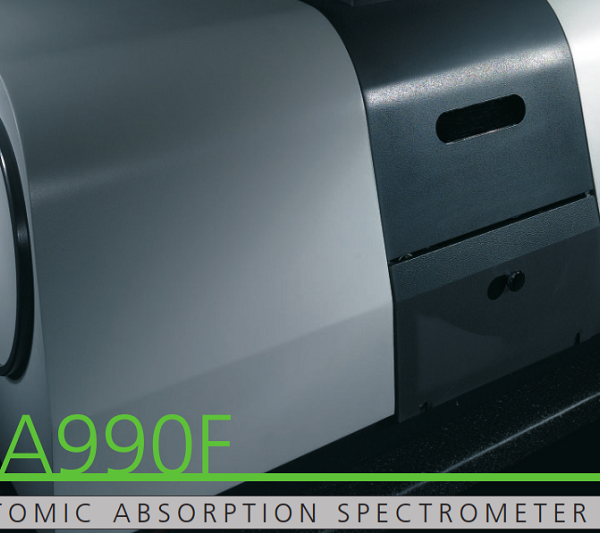 The 990 Atomic Absorption Spectrophotometer is a versatile entry level instrument computer controlled an Air/Acetylene flame ONLY for general laboratory needs. 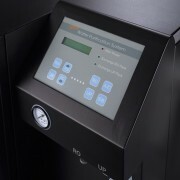 The instrument has a motorised 8 hollow cathode lamp turret which allows the automatic positioning and optimisation of each hollow cathode lamp by the software. 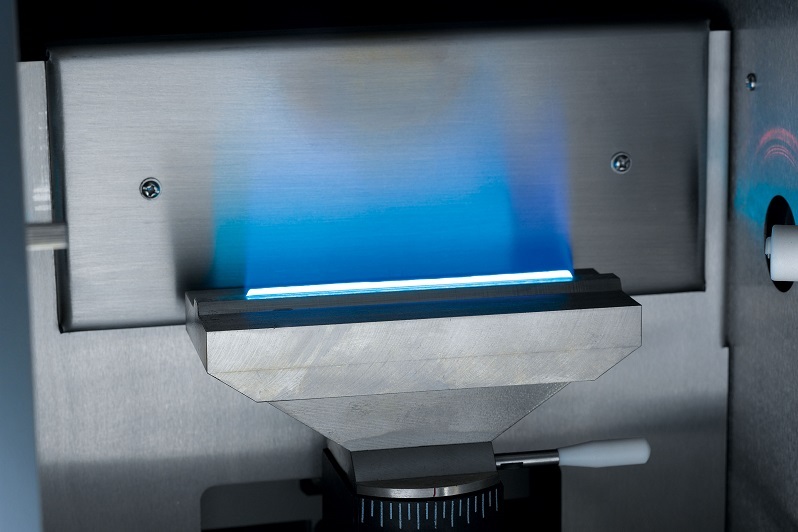 The control of the gas flows for the fuel gas (C2H2) of the burner is also carried out directly from the software thus allowing optimisation of the instrument for the best analytical parameters for a selected analysis. Two methods of background correction are available. 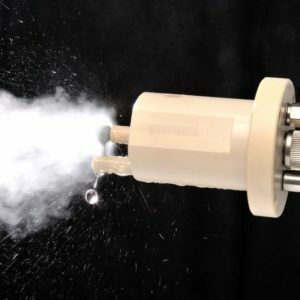 The first utilises a Deuterium Arc lamp and the second is the proven method of Self Reversal. 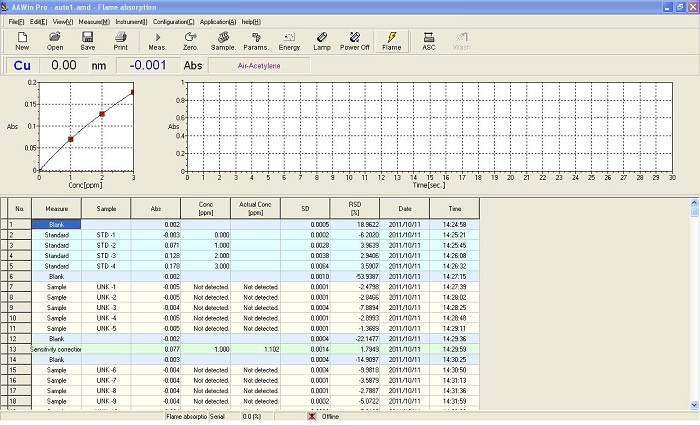 The location of the wavelength and peak selection is automatically controlled from the software. 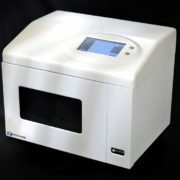 The spectral bandwidth is automated and is available with a choice of five slit sizes. 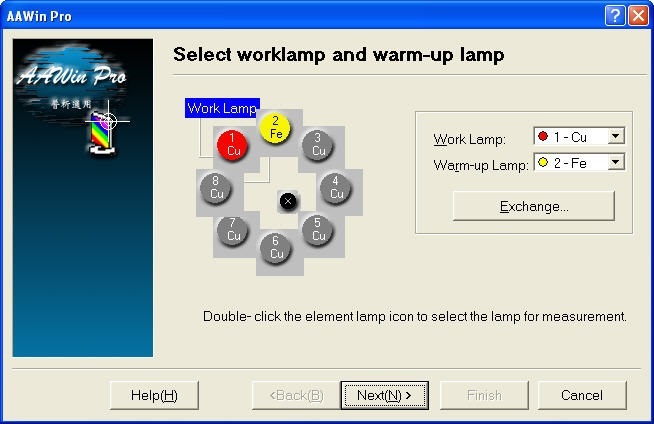 The electronic parameters for the photomultiplier tube detector, the hollow cathode lamp current and the balancing of the absorbance and background energies are controlled from the software. 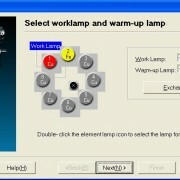 The ignition of the flame is computer controlled and the various safety interlocks offer a very safe operating system. The flame conditions are continuously monitored and should the flow rates change, an audible alarm sounds. 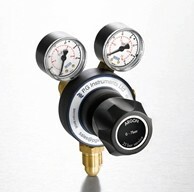 The pressure of the support gas (oxidant) is monitored constantly. If the pressure changes then the flow of the fuel gas will be stopped and the flame will be safely extinguished. A sensor monitors the level of liquid in the drain and will prevent ignition if too low. The flame will also be extinguished if the level of liquid in the drain changes significantly. 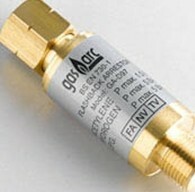 A flame sensor monitors the flame and safely turns off the gas flow to the burner if the flame suddenly extinguishes. 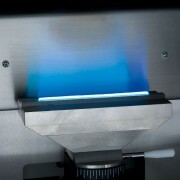 The burner is identified by a switch making it impossible to light without the burner being fitted. An emergency flame off button is installed in case a problem is observed. The flame can be extinguished safely. 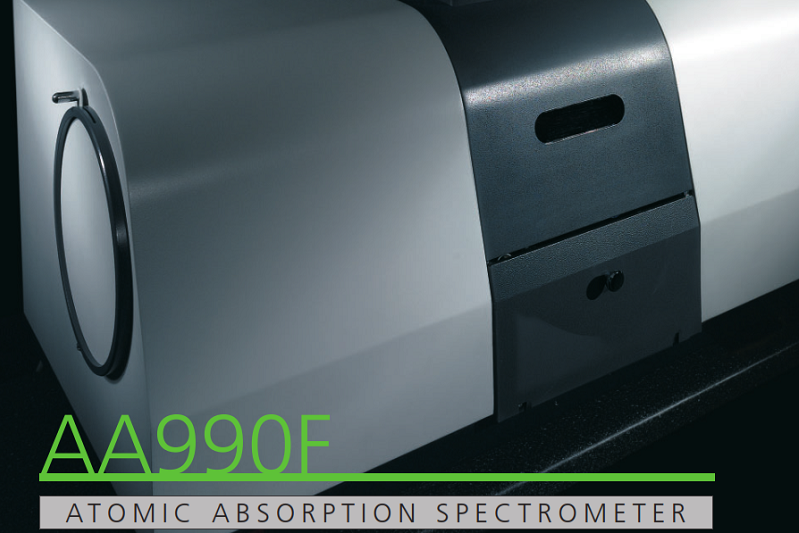 AAWin Software is a powerful and intuitive software product designed to allow control and data acquisition from the PG Instruments PG990 Atomic Absorption Spectrometer. 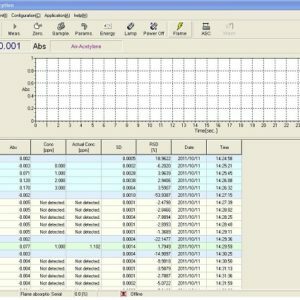 The AAWin software allows the Analyst to control all aspects of their analytical method whilst providing an extensive range of tools for data collection, storage and interpretation. 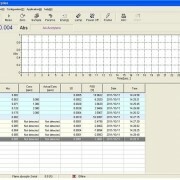 The software interface consists of three key work-areas, whilst having toolbars to access many others. 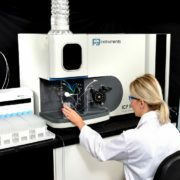 These work areas allow the user to view real-time signal acquisition, up-to-date display of calibration curves and a flexible, sample table. 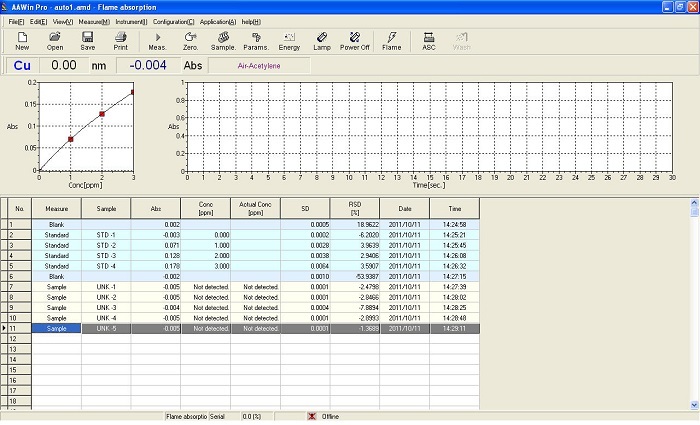 Obtain reliable and accurate results by using the Energy control feature to manually optimise atomiser position and setup. Use the Auto-balance feature to ensure energy level. 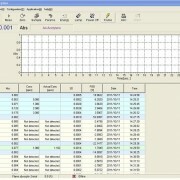 Use the sample table to perform quick measurements of both Standards and Samples. Easily append the sample table to add new samples or even revise calibration curves either by manual introduction or using an Autosampler. View up-to-date calibration curves in 1st, 2nd, or 3rd order using a standard calibration or standard addition. Perform retrospective curve fits to ensure optimum correlation. View real-time signal acquisition for flame and hydride generation analysis.